Small and mid-sized businesses with limited IT staff are constantly on the look-out for products that will improve their ability to secure networks. Today SonicWall announced what it says is its largest product roll out in company history, vowing they build a wired and wireless network protection platform. The five announcements include a new version of the SonicOS operating system for its firewalls, an updated high-performance firewall, a series of new 802.11ac Wave 2 wireless access points, a cloud analytics service and advanced secure federated single sign-on (SSO) capabilities. Network administrators, managed service providers and channel partners who sell the company’s products should see benefits from the new capabilities, he added. The interface organizes functions under three tabs (Manage/Monitor/Analytics). 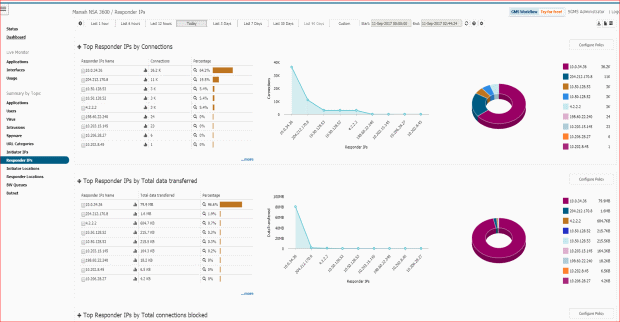 Manage has all of the firewall control functions, Monitor shows charts of who is doing what, what apps are in use, type of traffic network and other metrics. Administrators can toggle back and forth between the new and old interface to learn at their own pace so there isn’t an immediate productivity hit. Gordineer said. Among the added features is support for multi-domain authentication to manage and enforce security policies across an entire organization, and a suite of wireless features that enables security and connectivity for mobile users. –the NSA 2650 firewall for mid-market and branch offices. It has twice the deep packing inspection throughput and 12 times number of encrypted connections that can be connected (12,000 total encrypted sessions) than the NSA 26000, which it replaces – and does it over 2.5G wired and 802.11ac Wave 2 wireless networks. It support both multi-engine sandboxing via the Capture Advanced Threat Protection (ATP) service. There are eight 2.5G Ethernet interfaces, matching network throughput with the new SonicWave Wave 2 wireless access points (see below). It also includes 10 Gb interfaces and 20 total ports for those who need port density. The NSA 2650 retails for US$2,495 without a security subscription, and US$4,465 with one year of gateway protection including 24×7 support and the Capture ATP Sandbox. 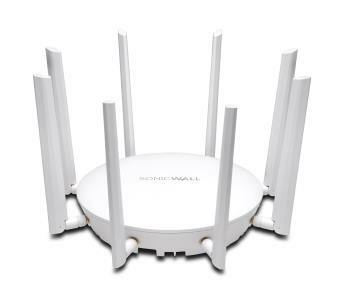 –The new line of SonicWave 802.11ac Wave 2 access points, immediately available, include models with internal (432i) and external (432e) antennas, as well as the company’s first outdoor AP (the 432o). This last model, which has a variety of antenna options can be used in outdoor cafes and food markets, will be a good opportunity for channel partners, Gordineer said. All have 2.5 Ghz and 5 GHz radios. Devices that meet the 802.11ac Wave 2 standard supports speeds of up to 2.34 Gbps (up from 1.3 Gbps) in the 5 GHz band, and supports multiuser multiple input, multiple output (MU-MIMO) for improved performance. These units also can take a 4G USB card as a redundant Internet connection over a cellular network. It would be appreciated, for example, by tetailers who need to maintain a constant connection for point of sales devices. These new access points will also be sold under a new pricing model: Following the lead of some other AP manufacturers, the price of the SonicWave 2 hardware is lower than traditional models but buyers have to purchase a subscription licence of up to five years to cover software upgrades. This, Gordineer said, reflects the fact that increasingly software is the vehicle for delivering new capabilities. Pricing for the indoor APs starts at US$899. The outdoor AP with a one year license costs US$1,749, with antennas as an optional add-on. –An update to the Secure Mobile Access operating system to version 12.1. It runs on the SMA hardware or software gateway offering SSL and VPN protection for remote workers, but with the update it now supports the Capture APT sandbox, meaning SMA devices can scan all files from any employee or partner remote devices. A new HTML5 file explorer replaces the old Java based implementation. This joins Capture APT’s earlier support for SonicWall firewalls and email security gateways. There’s also support for creating a Web portal with single federated sign-on for remote workers to all company applications. Through one login the OS will communicate with all authentication servers for all apps. –A new Cloud Analytics service is now in beta testing. It’s an addition to SonicWall’s Cloud Global Management Service (GMS) software as a service for managing SonicWall devices started earlier this year. Expected to go live in early Q4, the analytics service will allow admins to network traffic, security events, threat profiles and other data. Analytics can be performed in real time. No pricing was given. “The vision is to create a security platform and try to hit all components – from the network to the users to the Wi-Fi users, BOYD and IoT and help our SMB customers … deal with the challenges they have,” Gordineer said of the announcements. SonicWall has over 500 channel partners in Canada. Some of the largest managed security service providers include WBM Office Systems, Carefree IT, Ltd., and Omega Network Solution. A few of SonicWall’s largest resellers in Canada include Netcetera Consulting Inc., Triware Technologies Inc., A&R Solutions, Gentek Marketing Inc., EastBay I.T. Consulting Inc., Spencomp Solutions Inc., WBM Office Systems, Tenecom Solutions, Telebec LP, Oxygen Technical Stervices Ltd., CDW Canada, Insight Canada, and Softchoice.